What are your favorite indoor activities on a cold winter day? Here are three fun & free printable winter activities for your kids! The first game is a winter charades game. This game is filled with charades related to winter activities. There are charades for everything from “slipping on a patch of ice” to “dog sledding”. You can turn on the fireplace and gather your family together for some delicious hot chocolate and this interactive game. Simply print the free printable winter charades, cut out each charade and put them all into a bucket. Team A takes a turn choosing 1 person as an actor. The actor randomly selects one charade and then has a limited amount of time to act it out. If Team A guesses the correct answer, they earn one point. If Team A doesn’t guess the correct answer, Team B gets one try at the correct answer to win a point. The game continues until you run out of charades. The second game is a winter word scramble. 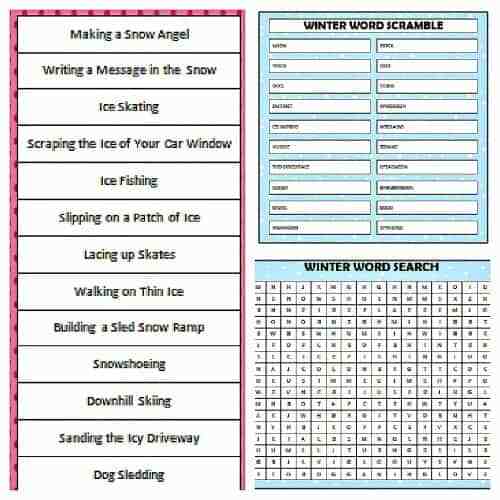 Simply print out this free printable game and have your kids try to unscramble the winter-related words. The answers have been included on the bottom of the printable game. The third game is a winter word search. If your kids will be playing both the word scramble and the word search, have them play they word scramble first because the words used in the scramble are the same words used in the word search puzzle. To play this game, simply print the free printable word search and have your children search for the words listed on the bottom of the printable. What is your favorite outdoor winter activity? I think our favorite is tobogganing. We’re always adding fun new ways to celebrate the holidays along with freebies. Never miss an update by following us on Facebook, Twitter, Pinterest and Bloglovin’.